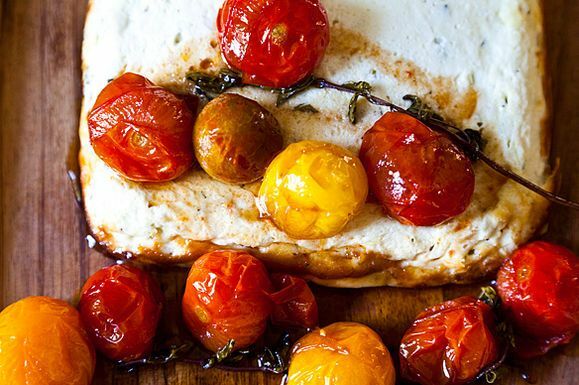 Congratulations to TheRunawaySpoon, whose Baked Ricotta and Goat Cheese with Candied Tomatoes won this week's contest for Your Best Cherry Tomatoes, earning her big prizes from Viking, OXO and Tiny Prints, and a spot in the next Food52 cookbook! Really just being in the kitchen. 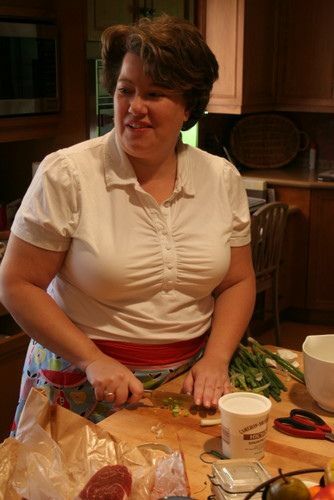 My family cooks – my Mom made a great dinner every night when I was kid, and my Dad was a great one for kitchen projects like making bread or pasta or cooking Chinese food in a wok. I visited my grandparents for camp every summer and my aunt would loan me her 1950s Betty Crocker Boys and Girls cookbook and let me choose what we would cook on the weekend. We even did the fun cakes shaped like teepees and drums. But I had this cookbook from a Junior League in South Carolina that came with colored metal measuring cups and spoons. The drawings in the book showed you when to use 1 red cup, or 1 green tablespoon. I cooked for my family from that book - I still use some of the recipes. It is one of my most treasured possessions. Gee, I hope I haven’t done it yet! It’s early days. I am always trying to grow and learn in the kitchen, so I hope each recipe gets a little better. Katharine Hepburn in Woman of the Year attempting to win Spencer Tracy’s heart by proving she can cook breakfast. It’s a complete disaster, but it still worked! This is a tough one. There a ton of people I’d love to sit at the table with, but many of them I’d be too nervous to cook for. I think I’d like to cook a meal for Calvin Trillin. I could cook up a good Southern meal, and maybe show the Kansas City boy what real Memphis barbecue is. Plus, we could talk food and maybe he could entertain me while I cook by speaking in rhyme! I immediately thought to answer alone – I like to be in charge! But I love cooking with my nieces and nephew, and have had some really fun moments in the kitchen with family and friends. My niece’s Iron Chef birthday party with 15 ten-year-old girls running around my kitchen may be the most fun I have ever had cooking. Sometimes I clean as I go, but mostly I do it at the end. I can’t imagine what an amazing cook I could become if I had someone else to clean up after me! I could put all my energy into the fun part. I've probably made your savouries a dozen times by now, and now this! Congrats on a great win! Congratulations Runaway Spoon! I loved reading your Q and A! Congratulations! Nice to "meet" you. Congratulations! I can't wait to try your recipe and loved your Q & A.
Congratulations on your win and a great recipe!!! Congratulations on the win! With a little tweak, this makde a scrumpy "home alone" dinner the other night. I'll be candying cherry tomatoes for other stuff now, for sure. Congrats on your winning recipe! I enjoyed your Q&A. I love paging through those old junior league cookbooks. Congrats on a fabulous recipe and win! Yay! Great recipe and Q&A! Congrats, RS. congratulations! thanks for sharing a great recipe.